Seamless Gutter installation for Backus, Brainerd, Hackensack, Longville, Walker and Pequot Lakes, MN. Reliable Seamless Gutters are located in Backus, Minnesota. We are centrally located in the heart of the Lakes Country. Reliable Gutters was started in 2003. We found a need in the area for a gutter contractor who would return phone calls and show up as promised. Reliable Gutters uses .032 inch aluminum from numerous aluminum suppliers, in order to meet any color needs. Reliable Gutters stand behind the 20 year material warranty on the aluminum. We install 3x3 downspouts, as they are 1/3 larger than the industry standard 2x3, allowing more debris & water through. We also use heavy-duty concealed screw hanger. 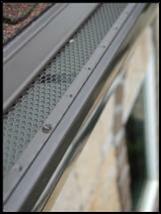 PREMIER GUTTER COVER ... Has a strong, low profile design, which actually utilizes rainwater to self-clean the cover. The patented self cleaning design features a louvered expanded metal section which sheds large, medium and even most small debris from entering the gutter system, yet still allows for maximum water flow which helps flush the gutter system. Premier Gutter Cover is unsurpassed in its versatility with roof and gutter styles, as well as its ability too handle extreme seasons and debris. The strong-attractive powder coat finish, custom color matching and sleek design blends with homes.